Did you ever set a personal sleep schedule but it just doesn't go as planned? Believe me. You're far from alone. Quite a number of people across this planet claim with confidence that they will definitely obey their perfect sleep schedule. It goes fine in the first a couple of days, however, people will find themselves exposed to the temptations of all kinds of stuff with the light casting on their face from the screen of their beloved cell phones in darkness as what used to be. Now, Apple comes out a new feature - Bedtime in the Clock app in the hope of helping terrible sleep schedule makers form a good sleeping habit and go out like a light as soon as hitting the bed. Actually, I've been using Bedtime for half a year and it's good to me so far. What Exactly is This Bedtime Feature? How to Use Bedtime on iPhone? What Should You Take A Try on Bedtime? After you upgrade your iPhone/iPad to iOS 10 and iOS 11, you'll find a bed lying in the Clock app. That's a new feature named "Bedtime". As the name implies, this feature is related to sleep with a deep-colored background trying to make you feel drowsy. Now, you don't need a third-party sleep manager to help you regularize your sleep habit. What you need is this Bedtime feature. In fact, Bedtime is intuitive to use. Just swipe from down to top to launch "Control Center" and select the "Clock" app. Then, tap the "Bedtime" right in the middle. When you toggle on the bar, you're allowed to set the exact time for going to bed and waking up. There is a clock on the screen with an adjustable bar. One side with a moon refers to bedtime, and another with a bell refers to the time when you should wake up. As SleepFoundation.Org suggests, most adults need 7 to 9 hours of sleep per day. You can adjust both in accordance with your habit. Note that if you have set sleeping hours every day. You can press the bar in the middle to change the time without changing sleep hours. Also, more options are available. Click "Options" on the left top and customize more. 1. Days of the Week. You can limit the Bedtime to prompt and wake you up on certain days. As for most people, weekdays are definitely included. And for the weekend, I have to say "No sleep. No weekend". The weekend is supposed to let us sleep as long as we want and enjoy as much as we like. 2. Bedtime Reminder. You can determine how far ahead of bedtime you would like to be reminded. Personal recommendation - 15 or 30 minutes before you go to bed. That's enough for you to get ready to fall into sleep. 3. Wake Up Sound. Apple seems to want us to be waked up with the voice of nature. There are 9 tones of nature that you can choose to wake you up. As for me, it feels perfect for me to get up in the sound of birds. For those deep sleepers, you can also adjust the volume. Users can directly look up the sleep condition in a week. For more history, you'll be redirected to the Health app. As the trends show, you can know whether you sleep enough as planned. When you tap "More history", sleep analysis will show you data in a day, in a week or in a month. Also, you're able to check out the exact times when you fall asleep and get up from your bed. If you find yourself a bit off the track, you should make yourself stick to the sleep schedule. Perhaps this feature seems nothing special for you. However, it's still a nice feature you should try. One of the benefits is that you don't need to set up two alarms anymore. Also, it's easy to change the bedtime and keep tracking your sleep hours. Perhaps you would have a puzzle in mind whether the data are accurate and authentic. After using Bedtime for months. I've noticed that Apple will not exactly follow the schedule you set in advance to simply think that you're asleep or awake. In fact, Bedtime seems to monitor your movements like whether iPhone is being used or unoccupied so as to detect your current situation. As for those who like keeping using their iPhones until asleep and as soon as waking up, the data must be accurate. A good day starts with enough sleep. Sleep is conducive to recovering energy as well as keeping us fit and sober. If you do attach importance to sleep, the Bedtime feature is the one you definitely don't want to miss out. If your friend is having trouble in sleeping, share this essay and tell him/her to try Bedtime. Advance Notice: The upcoming article will fully introduce Apple's default mail service. If you're not used to using the Mail app, perhaps it's time to learn your way around it. ANONNYMOUSHACKER08@GMAIL. COM) has worked for me on several occasions, he hacked a friends computer system who wanted to ruin my life, again, he helped mop some articles on some websites and recently he hacked a Facebook and an email account and provided the key loggers for me. Thanks so much …. 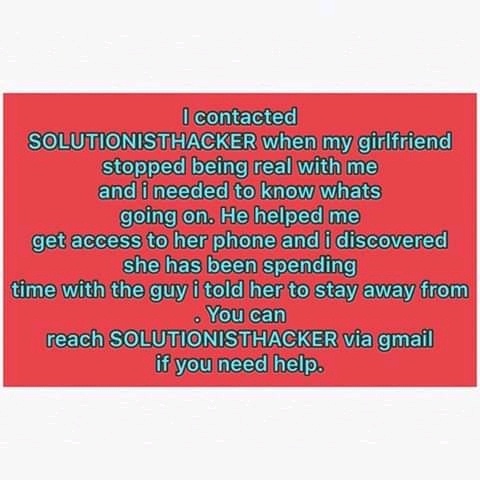 SOLUTIONISTHACKER AT GMALE DOT COME.